Should you run out and buy Yoshi's New Island? Eh...maybe wait on it. Having only recently acquired a 3DS, I have been catching up on the titles that have come out over the past roughly four years. The one I have just received that I feel needs some notice would be Yoshi’s New Island. Now, two of those things are complaints. When it comes to complaints like those, I tend to think “oh, they’re just putting on nostalgia goggles or something” and dismiss them, most of the time. So, I decided to get the game myself instead of Luigi’s Mansion 2: Dark Moon. Turning the game on, the first thing I notice is…there’s no opening story! The previous two games (or three games, if you count Yoshi’s Story) had story bits when you loaded the game, so it was weird to just be met with the title screen. Let this serve as a symbol of things to come. The next thing I notice is that the music is…bizarre, I am not going to lie or exaggerate here. It’s like someone was dared to make the music of the game out of kazoos, squeaker toys, and tinker bells. I mean, the music in the intro scene (since they at least had the courtesy to keep one of those in) was like a kazoo Star Wars theme. Mostly at one point in the song. There was someone’s video I saw long before this that I thought it WAS a silly parody mix, but no, it was this game’s strange squeaker-tunes. I don’t want to say it’s outright bad, but it’s certainly something that makes me unable to take the game as seriously as I’d like. Next up, the graphics! It’s like they wanted to emulate the look of the Super Nintendo game, but mix it with 3D models, and it came out looking really ugly. I am not impressed, but I’ll live. After the intro, I played the first level and…well, to explain how the Yoshi’s Island games work for those not in the know, you have to get to the end of a level, collecting Flowers and Red Coins on the way, and getting as many Star Points as you can. Star points act as health, and you have a max of 30, and start with 10. 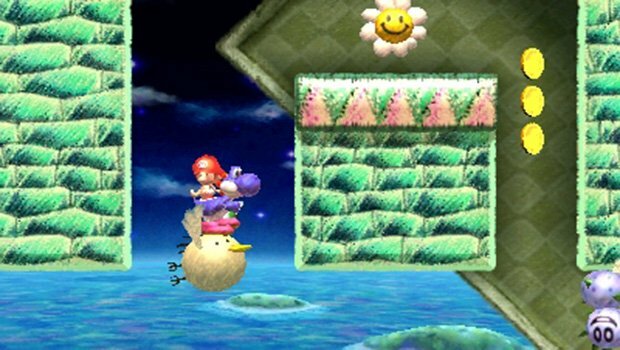 In these games, you are rewarded with extra stages to play for beating levels with 100% of the items, or getting around 800 accumulated points in a world in the remake. I am a completionist at heart, but…I guess just the combination of music I really don’t want to listen to and visuals that I don’t want to look at, I just can’t bring myself to frantically grab everything that ain’t nailed down like the previous games. This is more of an observation than a statement. The next bit I noticed in the first level is that the environment is bland. It’s trying to emulate the SNES game so badly that it seems to forget what made it look more interesting there: visual flair. The backgrounds are either literal rips or fairly close recreations, but they just don’t fit. After the third stage, I decided that I really couldn’t play this game like the other Yoshi’s Island games. I had to develop a new mindset: Just enjoy the game and get to the end. From there on, I enjoyed myself more. I can live with the clashing nature of things, because it’s still enjoyable. One of those things, which actually surprised me, was the boss fight of the first mini-fort. I did not see this coming, because it was brand new! Skip to the next paragraph for saving you of spoilers, but the boss fight was against Kamek, and you had to hit buckets to nail him with bombs. It’s a simple fight, but it’s different because it’s not just “gigantified random mook” that they had in the past games which worked there but would have come off as a stale concept here. 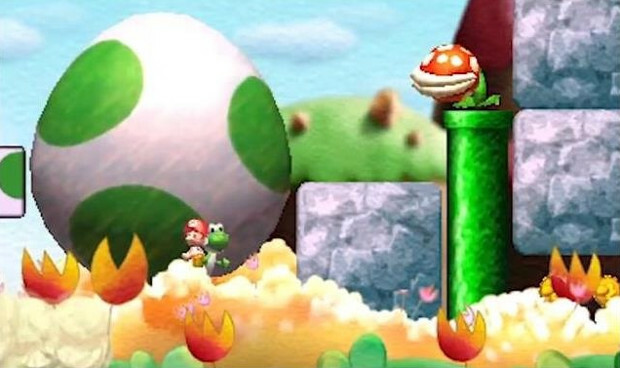 The game runs off the, in my opinion, lame egg physics of Yoshi’s Island DS. That is, green eggs bounce twice, yellow once, and red just crumples up in a heap. It’s really disappointing because the amount of bounces you could get in the original game are fantastic, and it’s just limited what sort of trick shots you can pull off with only two bounces. Dying is stupid. What I mean is that most games make you feel like you’re still in the game after you die. Mega Man makes you explode, Mario makes a tune and you fall off the stage, Earthworm Jim’s suit blows up on him. It’s fairly simple, but this game doesn’t play any tune when you die. Yoshi just makes a sound, baby Mario cries twice, and then the game snaps—no transition I can recall—to the “Try Again?” screen. It’s jarring as heck. You can’t lick up Star Points, and it makes me sad. When you die and restart, you only have 10 Star Points. This really dissuades me from pursuing 100% completion after dying and restarting from last checkpoint. And as stated earlier, Star Points are needed for completion. All in all, I feel the game series loses a star per sequel at this point. It’s going to be pretty hard to do worse than this without being expressly bad, but who knows how I’ll feel once I beat the game. These are my first impressions, and perhaps I’ll document my final impressions when that day comes. Keep it groovy, yo. Yay, a new guest post! And a solid one, at that. Chip's Challenge: Coming to a floppy disk near you.